COWARDLY Raymond Schwab – Desperate For My Attention! – Kent Hovind v. Robert Baty – The Great Debates! Home→COWARDLY Raymond Schwab – Desperate For My Attention! 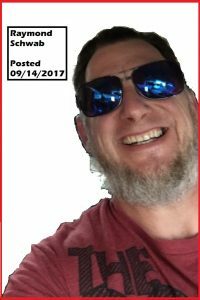 Despite my outstanding invitation/challenge, Raymond Schwab prefers to talk about me instead of face me, openly and honestly and deal with his problems, or problems he has with me. Didn’t he recently post a video in which he claimed he wasn’t going to mention me again. Maybe he just meant in that video, because after being silent for awhile he opened up on me big time with his cowardly rant this morning (September 13, 2017). Following is the link to his post and the text. Some might notice that nowhere does Raymond present any actual documentation as to anything I posted or said. I think he is too cowardly to do that lest his people be informed on the matter. Raymond, contact me, in writing, and we can negotiate how best to advance our conversation of your problems and misguided course, or not! Also, Raymond, I am still waiting to find out from you and/or Kent Hovind the details of that conversation you had with Kent Hovind, and others, about me. So. Lovely troll fest this morning. 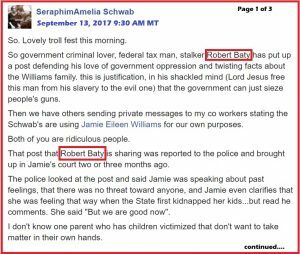 So government criminal lover, federal tax man, stalker Robert Baty has put up a post defending his love of government oppression and twisting facts about the Williams family. This is justification, in his shackled mind (Lord Jesus free this man from his slavery to the evil one) that the government can just sieze people’s guns. 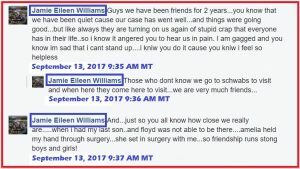 Then we have others sending private messages to my co workers stating the Schwab’s are using Jamie Eileen Williams for our own purposes. Both of you are ridiculous people. That post that Robert Baty is sharing was reported to the police and brought up in Jamie’s court two or three months ago. The police looked at the post and said Jamie was speaking about past feelings, that there was no threat toward anyone, and Jamie even clarifies that she was feeling that way when the State first kidnapped her kids…but read the comments. She said “But we are good now”. I don’t know one parent who has children victimized that don’t want to take matter in their own hands. 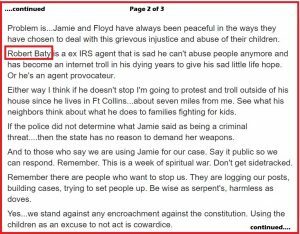 Problem is…Jamie and Floyd have always been peaceful in the ways they have chosen to deal with this grievous injustice and abuse of their children. Robert Baty is a ex IRS agent that is sad he can’t abuse people anymore and has become an internet troll in his dying years to give his sad little life hope. Or he’s an agent provocateur. Either way I think if he doesn’t stop I’m going to protest and troll outside of his house since he lives in Ft Collins…about seven miles from me. See what his neighbors think about what he does to families fighting for kids. If the police did not determine what Jamie said as being a criminal threat….then the state has no reason to demand her weapons. And to those who say we are using Jamie for our case. Say it public so we can respond. Remember. This is a week of spiritual war. Don’t get sidetracked. Remember there are people who want to stop us. They are logging our posts, building cases, trying to set people up. Be wise as serpent’s, harmless as doves. Yes…we stand against any encroachment against the constitution. Using the children as an excuse to not act is cowardice. St Francis has no right, nor Kansas, nor DCF to seize law abiding parents weapons or force them to surrender them. Period. People Like Baty and his trolls are agents against parents and families. When we get back from D.C….if some people want to post up with signs in Baty‘s neighborhood let me know. Jamie, are we using you for our own nefarious agenda? Have we been support for you. Can you please set the record straight about if you feel we are using you? one or more of them made against CPS workers. against child welfare workers and others. authorities ought to do in response. he’s added it to his YouTube. I don’t see where Raymond has anything to whine about. threats to give up their guns seems appropriate.